So That’s How They Do It blends a little wit and humor, with a boatload of sage advice from those who have mastered the craft of business. 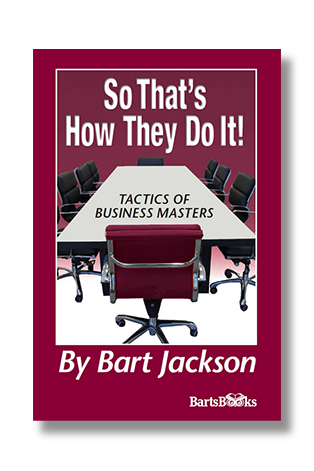 In brief, bite-size, easy to read nuggets, international journalist Bart Jackson reveals the best tactics garnered from thirty years of interviewing business’s most successful. From Warren Buffet and Michael Bloomberg to Jack Welch and Sam Walton, these pages are filled with tips and tactics wrung from the hard-won experience of these and other senior corporate executives. Learn to inspire trust, build relationships, and develop your personal brand. Each of the techniques, disciplines, and mindsets are succinctly distilled, affording you scores of “Ah – ha” moments that will sharpen your career. Who says learning the best pathways of business cannot be fun?